1. Summertime and wintertime shovelling. For a special indoor physical activity, pour the contents of two bags of cotton balls on the floor in your daycare. Bring your kid-sized plastic shovels indoors and let children use them to shovel the cotton balls as they would shovel snow. Have them deposit the cotton balls in a large bin. Once all the cotton balls have been shovelled off the floor, they will enjoy turning the bin upside down and playing in the "snow" before shovelling it all over again. 2. Soft alphabet. You will need 26 pieces of colourful construction paper. Trace a different letter on each one. 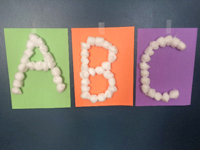 Have children glue cotton balls on the outline of each letter. Display the letters on a wall, in alphabetical order. 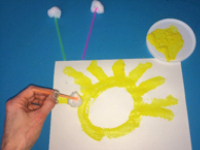 Encourage children to trace the soft letters with their finger. Hold children's hands or demonstrate the correct direction or sequence for "drawing" each letter. 3. Cotton ball flick game. Use colourful electrical tape to draw a square playing area on a table. In each corner, draw a smaller square. Invite two children to stand on either side of the table. Give each one five (5) cotton balls. Show them how they can gently tap the cotton balls with their fingers, aiming to land them in one of the smaller squares at their opponent's end of the table. The game lasts between 2 and 3 minutes. If a cotton ball falls on the floor, players can pick it up and put it back into play. 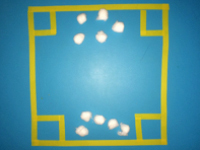 However, if a cotton ball reaches a goal (small square), it must remain there until the end of the game. When the time's up, the player who landed the most cotton balls in his/her opponent's goals wins. 4. Silent tennis. Divide your group into teams of two children. Give each child a piece of colourful cardboard. Provide each team with a cotton ball. Show children how they can use their piece of cardboard as a racket to tap the cotton ball back and forth with their partner. Cotton balls bounce quite well. Who will hold the record for the most successive taps? 5. Tap painting. 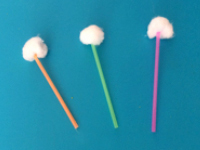 Use hot glue to stick a cotton ball on the tip of a drinking straw. Repeat with several different straws to create a unique paintbrush collection. Pour different colors of poster paint in small containers and let children tap the cotton balls in the paint and then on paper to create designs. 6. Whipped cream look-alike. Glue cotton balls in mugs, plates, or bowls to represent whipped cream. Children will love serving cream pies, hot chocolate, and frozen treats in your kitchen area. Let them help you create a wide range of foods and use them to transform your area. It can become a fast food restaurant, an ice cream parlour, a café... Of course, you will be their favorite customer. 7. Soft animals. Gather all your sheep, cat, dog, and bear figurines. Use double-sided adhesive tape to stick cotton balls all over each animal's body to represent soft fur. Children will love manipulating and playing with them even more than usual due to their soft texture. 8. Cotton ball curtain. 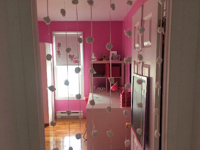 You will need several cotton balls to make a curtain. You can use a small needle to thread the cotton balls on several long pieces of invisible wire. If you prefer, you can simply glue cotton balls on long pieces of ribbon as I did. Hang several wires or ribbons in a door frame to create your curtain. Children will love walking through it. It will be a great addition to your daycare décor, especially in your reading and relaxation area. 9. Snowy pictures. Use adhesive paper to secure several different pictures cut out of magazines on the floor within your daycare. Hide the pictures by completely covering them with cotton balls. 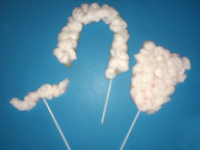 Provide tiny brushes (used to clean snow off cars) and encourage children to use them to brush away the cotton balls. They will love discovering the hidden scenes. Invite them to name the items they see in each picture as they appear. 10. Cotton ball photo booth. Cut beard, eyebrow, moustache, and hairstyle outlines out of heavy cardboard. Glue cotton balls all over them and add a wooden stick or drinking straw behind each one. Have children hold the various accessories in front of their face as they pose for you. Print the pictures and display them on a wall. Children will love looking at these « soft » and silly memories.